From the beginning of the Authentic Blogger (AB) Group Page concept, Marty and I agreed that our main focus would be to promote fellow bloggers, provide a community forum for this wonderful writing genre and also encourage bloggers worldwide to keep growing, dreaming and learning about the blogging process. 1. Be an active member of the Authentic Blogger Facebook Group Page. 2. Be actively posting Blog post links on Authentic Blogger wall. 3. Be actively interacting with fellow AB members, and taking enough interest in other blog posts to post comments on a regular basis. 4. Be a respectful member of the AB community. We will post an announcement of each week's Featured Blog Author on the AB wall, along with posting that person's name and blog link in the Admin Box on the sidebar of the AB wall beneath the AB logo image. 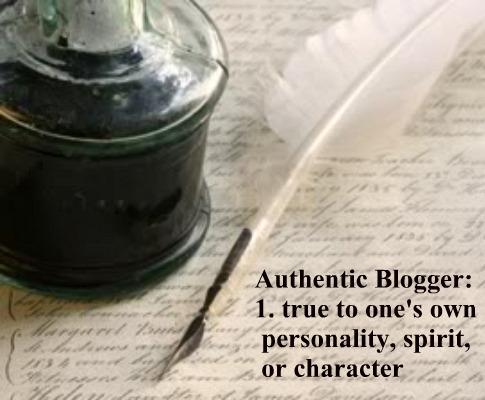 We will also have a running list on The Authentic Blogger blog page of every Featured Blog Author that is chosen, with their name and blog link listed. We hope you will all perceive this as the honor we intend it to be; we will take the process of awarding each weekly recipient just as seriously. I think this is a good idea. You soon learn who's involved and who's just promoting their own blog. I do admire your energy. Please send some along to me if you have any to spare. Ladies, thanks for the feedback! You both know how vital that feedback really is!! This was one of our very first decisions/wishes for the AB when Marty & I were still in the brainstorming process. I'm happy to know this idea is being received well. Jenn & Lyn, I forgot to add this: I have a FB Fan page for Healing Morning where I have started posting daily tips, quotes, points to ponder, holistic health stuff, etc. If you're interested, look me up on FB - here's the link! Send me a friend request also!